We’re the Official Bakery of the Baby & Beyond Expo Again! Why is this event so special to us this year?! Because it’s perfectly timed at just two weeks before one of the 3 Sweet Girls’ due date! We’ll be checking out all of the exhibitors and do a little (or a lot..) of shopping ourselves! We love the Baby and Beyond Expo because it’s gathers a unique collection of vendors with products that you can’t find just anywhere, all in the same place! This makes it a breeze for parents, grandparents, friends and family to see everything in one easy stop. From cribs and toys to adorable specialty boutique children’s clothing, It is the perfect place to find gifts for mom-to-be, birthday presents for little ones, and sweet treats for all of the above! It’s also packed with resources for parents on tons of helpful topics, from nutrition and healthcare to children’s activities in the area and local photographers! What do we bring to the table?! Sweet treats, of course. We’ll have a wide variety of decorated cookies, brownies, cake pops, chocolate dipped pretzels and Oreos, and cake push ups made just for the expo. Stop by for a snack to entertain your kids while your shop, grab treats to go for a weekend get together, or just treat yourself! We’ll have ideas and information about special ordering desserts for any gathering including upcoming birthday parties, pregnancy announcements, baby showers, gender reveal parties, and baptisms as well as any other event you could imagine planning! Check out our website to get a head start on ideas as you look through creations we have made in the past or fill out our order inquiry form to let us know what you’re looking for! This year’s event is on September 15th and 16th at the Sharonville Convention Center. We will be there Friday 10am to 5pm and Saturday from 10am-4pm as well as Friday morning for a special VIP hour from 9am-10am! Tickets are $8 for adults. Children 12 and under are FREE! We can’t wait to see you there! This race is a blast! Whether you are running, walking or doing a combination of the two (Yes, I’ve tried all three options and can vouch for them all) the Queen Bee Half Marathon is one of the most fun half marathons around. Last year, I was handed a bottle of wine as for completing the race and finishers under the age of 21 received a freshly baked 3 Sweet Girls cupcake! How much better can it get?! While these finisher’s gifts may vary year to year, the incredible cheering sections along the race course and views of Cincinnati are there to stay! There is also a 4 miler race option if you’re in search of a shorter race. The Michelob Ultra Victory Party is a perfect way to celebrate the morning post race with food, drinks and lots of good company! That’s not all! The Queen Bee is more than just a fun race, it’s geared toward women (although men can participate too!) and it supports incredible local charities, donating over $200,000 to them in the past. How does 3 Sweet Girls Cakery come into play?! 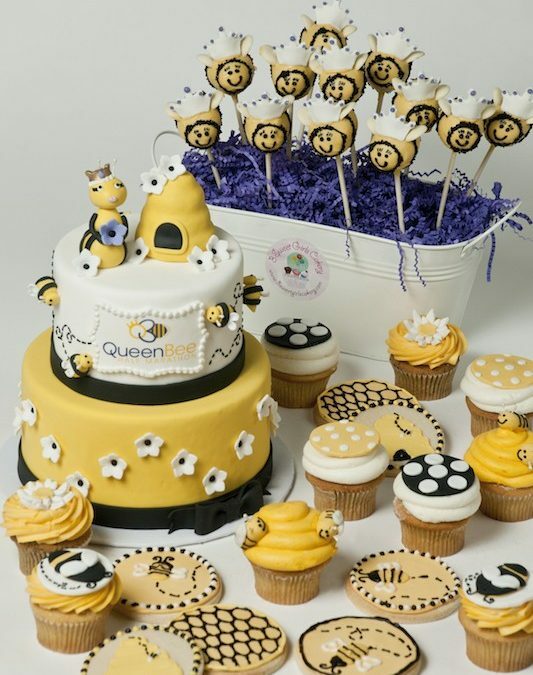 We are the official Bakery sponsor of the Queen Bee! We will be a the Bee-U-Tique Expo at Duke Energy Convention Center on Friday October 12th from 11 am to 8pm where you can find running vendors, and of course our booth full of a selection of Queen Bee themed treats! We’ll be making Queen Bee cookies, cake pops, brownies, and chocolate dipped pretzels and Oreos! Whether you’re running, walking or just tagging along for the expo, stop by for a sweet treat. You deserve it! 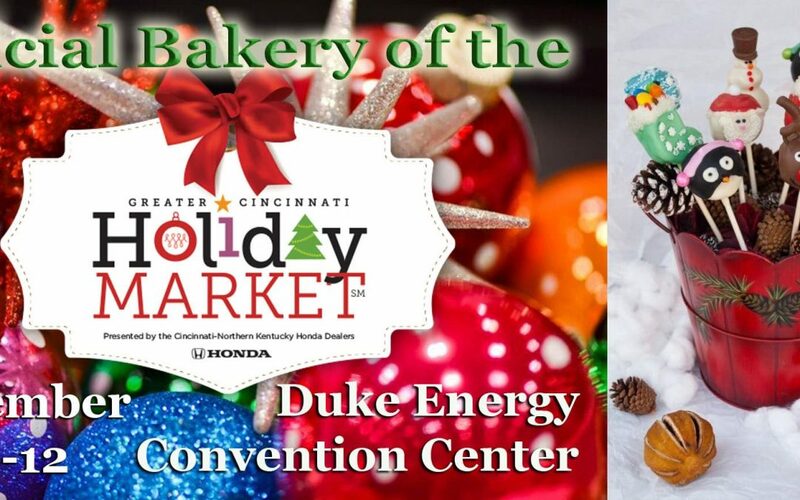 We are the official bakery sponsor of the Greater Cincinnati Holiday Market at Duke Energy Convention Center. We will be there with a variety of holiday cookies, cake pops, cake push ups, gourmet popcorn, brownies and other sweet treats. We will also be selling gift cards and taking holiday orders! To learn more check out their website and check our Facebook, Twitter & Instagram posts are the event approaches! Enjoy all the pizza you can eat from these 16 local pizzerias: Adriatico’s, Bub’s, Dewey’s, Fratelli’s, Giuseppe’s, Goodfellas, Krimmer’s, LaRosa’s, Mac’s, N.Y.P.D., Pisanello’s, Pizza Tower, Pizzelii, Ramundo’s, Snappy Tomato, and Roc-A-Fella’s Pizza. CINCINNATI (Sydney Benter) — There’s a new shop opening up in Over-the-Rhine that looks and feels like a real life candy land. The sweet treats come from a local mother and her two daughters; together they run Three Sweet Girls Cakery. It’s a family business that, quite literally, started in their kitchen. The Ebbert girls find themselves in an enviable position–surrounded by cupcakes and success. What started as a hobby has grown into a full-scale confection operation. 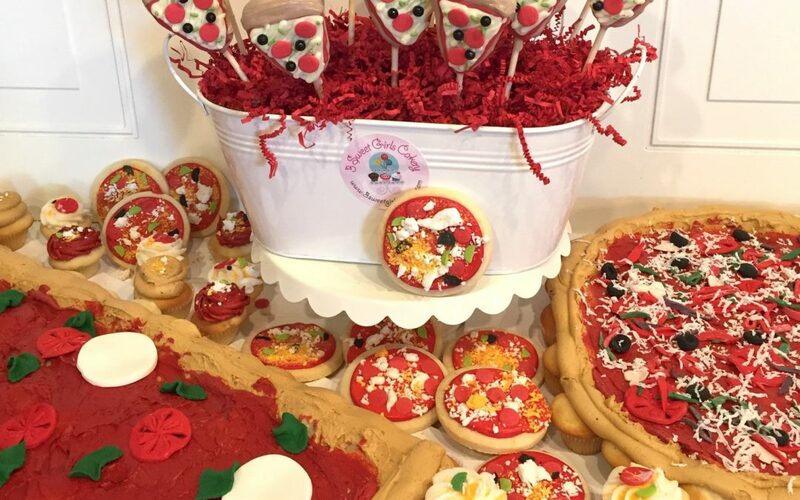 “We pretty much just did cupcakes in the beginning–just making them for friends and friends of friends and then it just grew into cake pops and cakes and cookies for lots of people,” says Kristen Ebbert. The family expanded their business into a space on Montgomery Road three years ago. They’ve grown so quickly that now they’re opening a second location in Over-the-Rhine. “We just thought it would be really fun to go down there and kind of be in the heart of the city and everything that’s going on,” says Lisa Ebbert, the family matriarch. Lisa and her daughters Lauren and Kristen are all equal partners in the cakery. “I think the coolest part is that we’re in charge of it so if there’s something we want to do we can try it and it gives us more freedom to–if there’s decorations we want to try or flavors or colors or anything–we can really explore whatever we want to work on; whatever is fun for us,” Lauren says. The OTR Three Sweet Girls location on East 12th Street is set to open the first week of July 2015. Follow Sydney Benter on Twitter @Local12Sydney, and LIKE her on Facebook. Follow us on Twitter @Local12 and LIKE us on Facebook for updates. Lisa Ebbert comes from a long line of bakers, and the success of her homemade cupcakes led her to open 3 Sweet Girls Cakery in Kenwood in 2012. In mid-July she and her two daughters, Kristen and Lauren, will open their second location at 29 E. 12th St. in Over-the-Rhine. Over the past few years, the bakery has had customers come out to the Kenwood location from downtown to pick up sweets for parties and meetings. It seemed like a logical next step to take the bakery closer to those customers. Ebbert and her daughters are currently renovating the 500-square-foot space to be a mini version of their Kenwood location, with turquoise and pink walls and a whimsical mural. The OTR location is considerably smaller than the original and doesn’t have a kitchen, so they will be bringing everything to OTR from the main bakery. 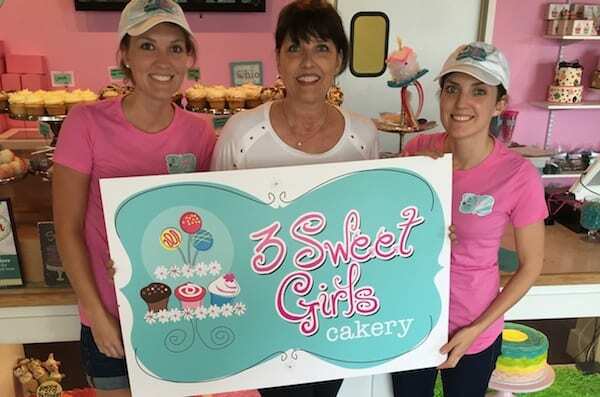 3 Sweet Girls will offer a daily selection of eight cupcake flavors and about 15 flavors of cake pops, including their specialty Flying Pig Cake Pops. 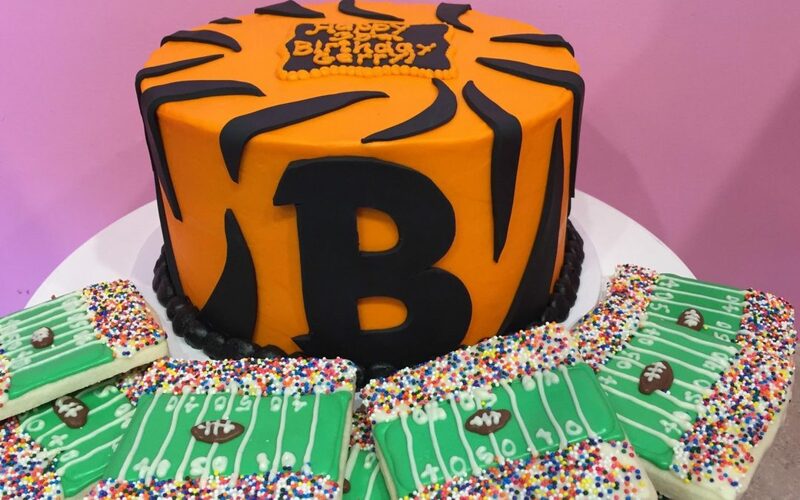 The bakery will also have custom decorated cookies, chocolate pretzels and Oreos, cake push-ups and cupcakes in a jar as well as homemade dog treats and pup cakes. “We hope to bring a fun, creative energy to Over-the-Rhine and hope to satisfy everyone’s sweet tooth and bring a little joy to people’s days,” Ebbert says. The Ebberts are currently hoping to be open before the July 14 All Star Game and plan to have a variety of baseball-themed treats.